The Cats eye is the Gemstone of the planet Ketu and is specially useful when the Mahadasha( major period) or Antar Dasha of Ketu is in Operation. Also referred to as the Vaidurya and Lahsunia it is as powerful a gem as the Blue Sapphire and special attention to go in the selection of the Cats Eye to ensure that it is free from any of the flaws as listed in the sacred texts. 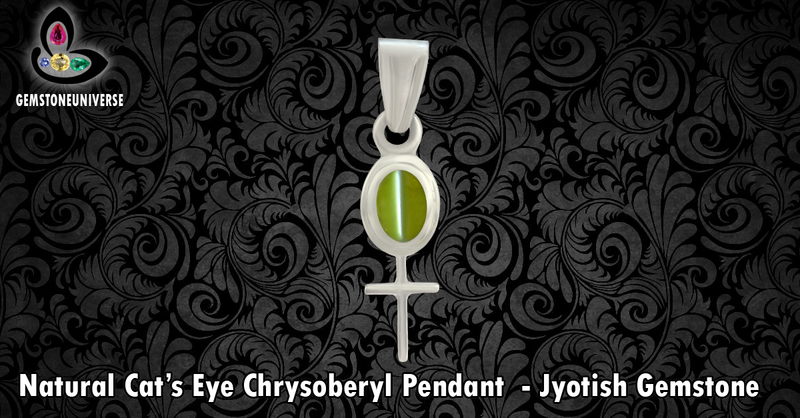 Comments Featured today is a Cat’s Eye Chrysoberyl set in the holy cross pendant design. Having its origin in Srilanka the basic body colour of this cats eye is a shade of honey green but as soon as it was set in silver it started exhibiting a much stronger deep Neptune honey green color.The cross is the symbol of Christ and represent Peace, love and compassion. The single outstanding feature of this Cats eye is the majestic and strong electric white chatoyant band that mimics the opening and closing of the eye of the Cat and hence cats Eye is called as a phenomenal gemstone and this effect is known as Chatoyancy.To view this Gemstone before it was set please click here.